Rather than make Agents come to seminars, or read educational materials, we created a Dotloop plug-in to help Agents learn in real-time, and to bring up 1031 as an option only when applicable. 1031 Exchanges don’t come up on every sale, but they come up a lot more than you’d think - roughly 1 in 4 residential homes sold each year could qualify! Co-Branded Landing Pages: Pre-qualify Clients instantly for HUGE tax-savings! 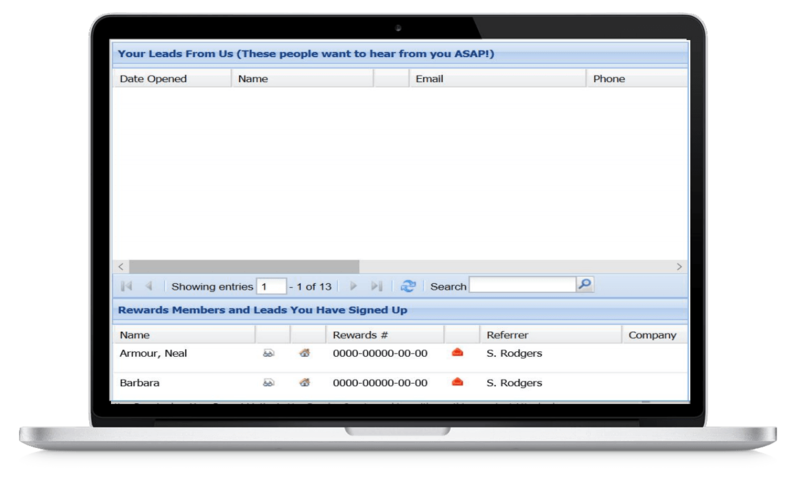 Engage and excite Prospects at Listing Appointments, in your Marketing Efforts, and beyond! Click Here to Build One Today! 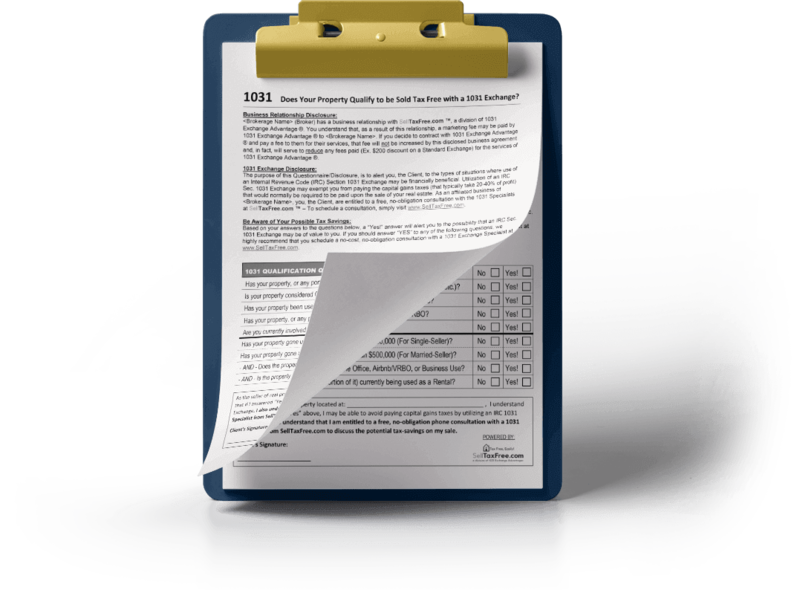 Tax-Saving Opportunities Disclosure: Built so nothing can fall through the cracks, use our Tax-Saving Opportunities Disclosure form so your Clients will never miss a tax-saving opportunity. 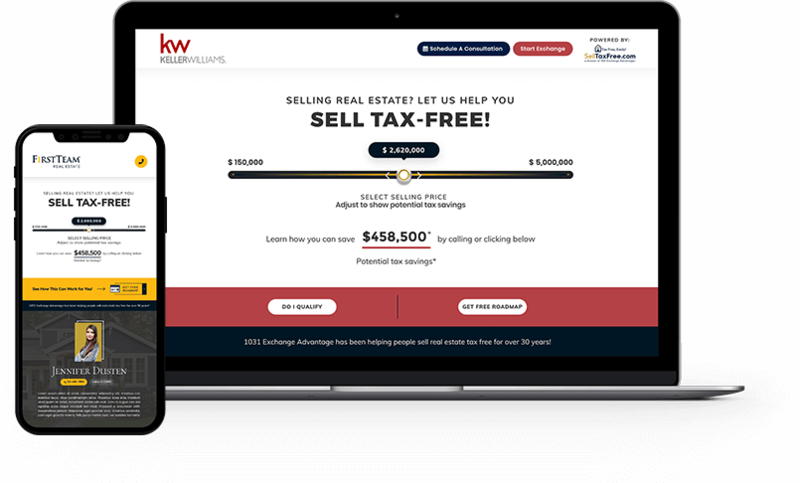 Pre-qualify Clients to sell tax-free, send educational e-booklets, and schedule consultations with 1031 specialists all from your co-branded landing page. 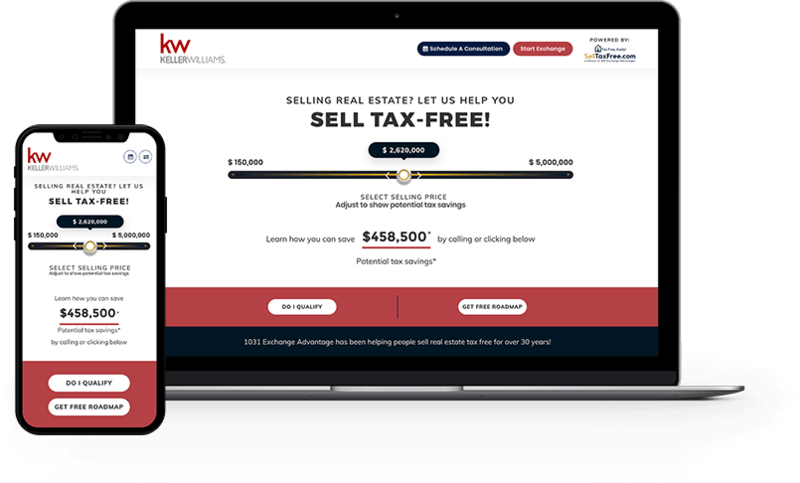 Use it to differentiate yourself at listing appointments, and in your marketing efforts to attract new sellers with a “Sell Tax Free” message! Integrate our Tax-Saving Opportunities Disclosure into your required listing disclosures to cut liability, and make sure that you’re pointing out tax-saving opportunities to Clients every time they’re available. Remember: An exchange requires a sale AND a purchase. By bringing up 1031, you give yourself an opportunity to get a buy-side lead from your existing sell-side Client! Using your Landing Page in your Marketing Efforts? If you’re using your landing page in your marketing efforts, you can access your Marketing Report here on our Agent Resource page to track your leads who’ve signed up for information, scheduled a consultation with us, or opened an exchange with us. 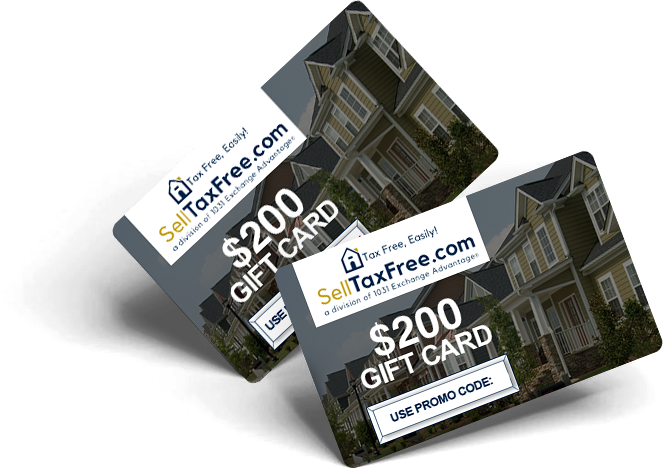 Offer a $200 Gift Card to Your Client and a Free No-Obligation Consultation with the SellTaxFree Team, when your listing qualifies! The Tax-Slider on SellTaxFree.com was designed to make it easy for you to show your clients how big their tax-problem could be, and how a Tax-Saving Opportunities Disclosure can help solve it! Interested in Marketing with these tools? Click Here! 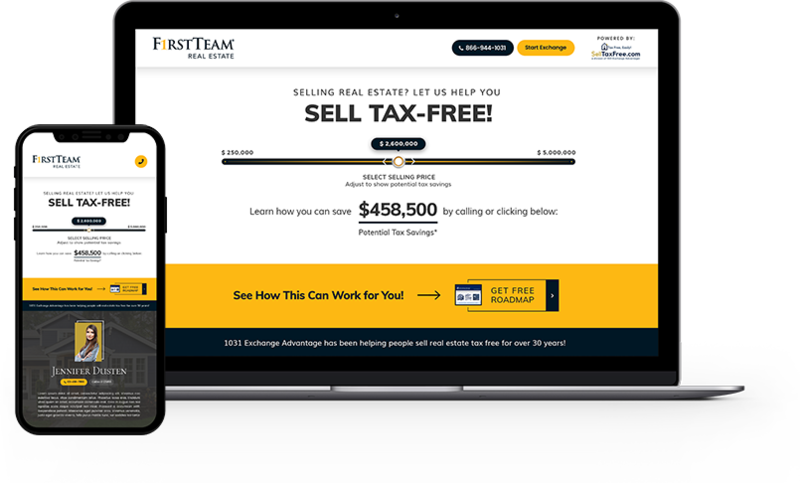 Engage New Clients with the "Sell Tax Free"
It's still a great listing lead! Click Here to see a sample). Use the videos to the left to learn how to talk about different 1031 scenarios. Learn the basics of why each situation qualifies, and how and when to make the handoff to our 1031 Specialists. 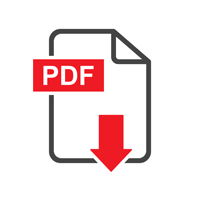 You can also Download the Scripts in PDF format. Do you own your own investment property? 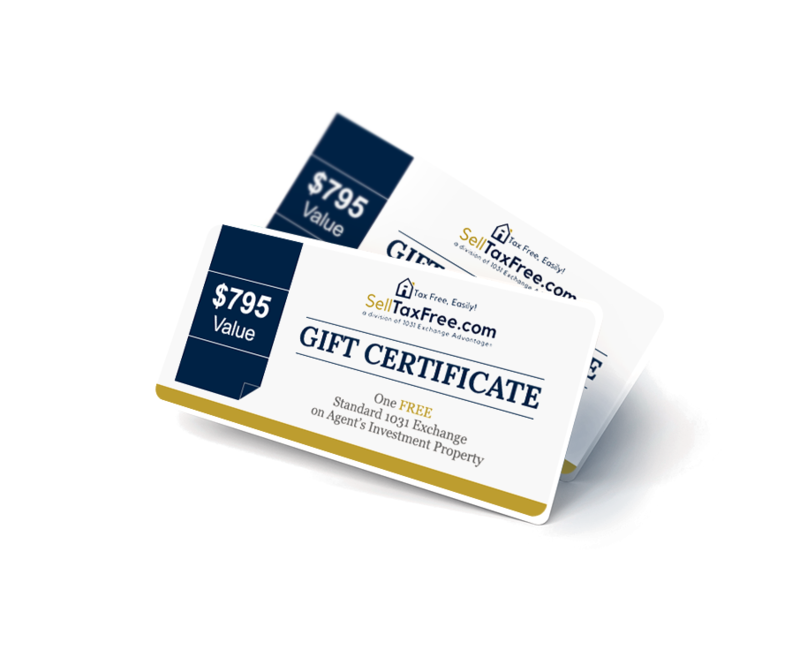 As a partner-Agent, we'd like to offer you a FREE 1031 Exchange ($795 Value), on us. To register, just sign up below! A 1031 Exchange is a provision of the US Tax-Code that allows property owners to sell investment real estate tax-free! Use a Qualified Intermediary/Accommodator (like SellTaxFree.com /1031 Exchange Advantage) to set up their exchange paperwork. Set up their exchange before they close on their sale. Reinvest all of the cash they'll net from their sale (after paying off mortgages, commissions, closing fees, etc.) into new investment property of equal or greater value. If you only partially reinvest you'll pay some tax and avoid some. 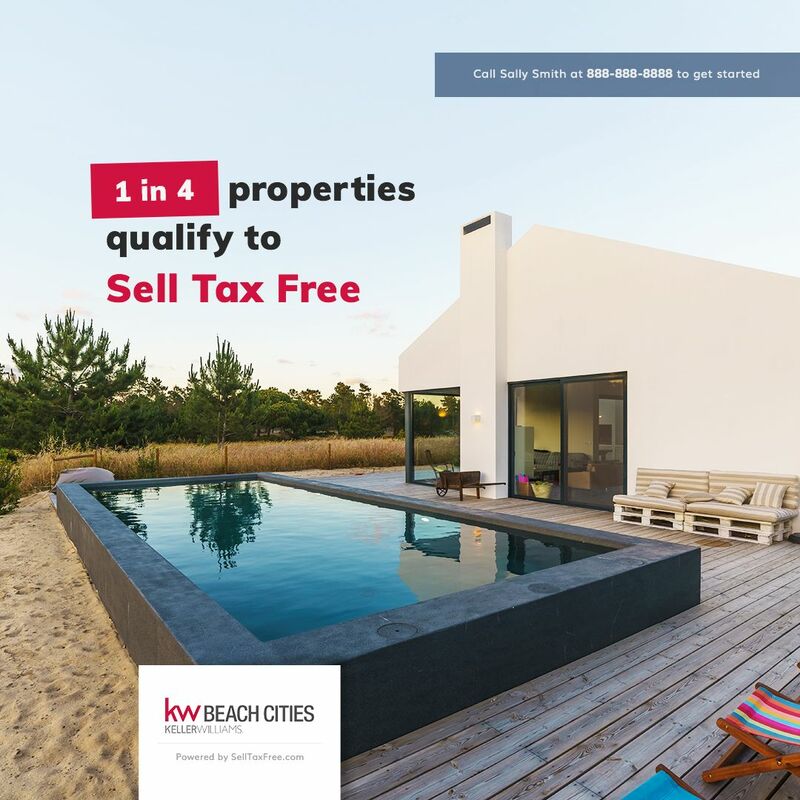 Which Properties Qualify to be Sold Tax Free with 1031? What is a Qualified Intermediary, 1031 Accommodator, or 1031 Exchange firm? They're all the same thing! The IRS requires a Qualified Intermediary/Accommodator (like SellTaxFree.comTM / 1031 Exchange Advantage ®) to facilitate the exchange, create exchange paperwork, and hold the Client's sale proceeds ($) from the time of sale until the Client purchases their replacement property (or properties). 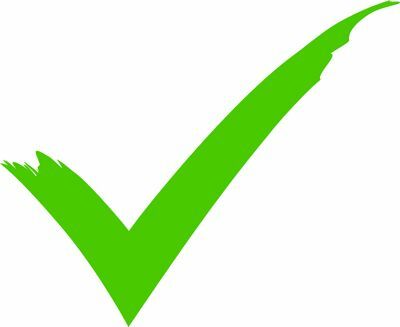 Is a Qualified Intermediary, 1031 Accommodator, or 1031 Exchange firm required? Can I use my escrow? The IRS requires that investors use a Qualified Intermediary/Accommodator (like SellTaxFree.comTM / 1031 Exchange Advantage®) when doing a 1031 exchange. Since a Qualified Intermediary/Accommodator is required to hold the sale proceeds ($), security of client-funds should be the highest priority; SellTaxFree.comTM has built industry-leading security protocols for securing client funds. When does a 1031 exchange start? The exchange starts on the day your sale closes, but the exchange paperwork must be set up BEFORE your closing. SellTaxFree.comTM can get an exchange set up in minutes. What is the timeline of an exchange? An exchange must be set up BEFORE the sale is closed. An exchange begins on the closing date of the sale. Replacement properties must be identified within 45 Days of the closing date of the sale. Replacement properties must be purchased within 180 Days of the closing date of the sale. What does it cost to do an exchange? How hard is it to set up an exchange? It's easy! In under 20 minutes, we can get you the documents you need for a successful 1031 exchange. To get started, go to www.StartMyExchange.com. How does a 1031 exchange benefit me as a Real Estate Agent? A referral commission from referring their client to another agent. Also, by bringing up a 1031 exchange, Agents can save their clients tens, or even hundreds of thousands of dollars in unnecessary taxes! That means referrals, and some serious Agent-appreciation from that Client. The Agent also establishes their real estate expertise by bringing up 1031 when it's applicable. 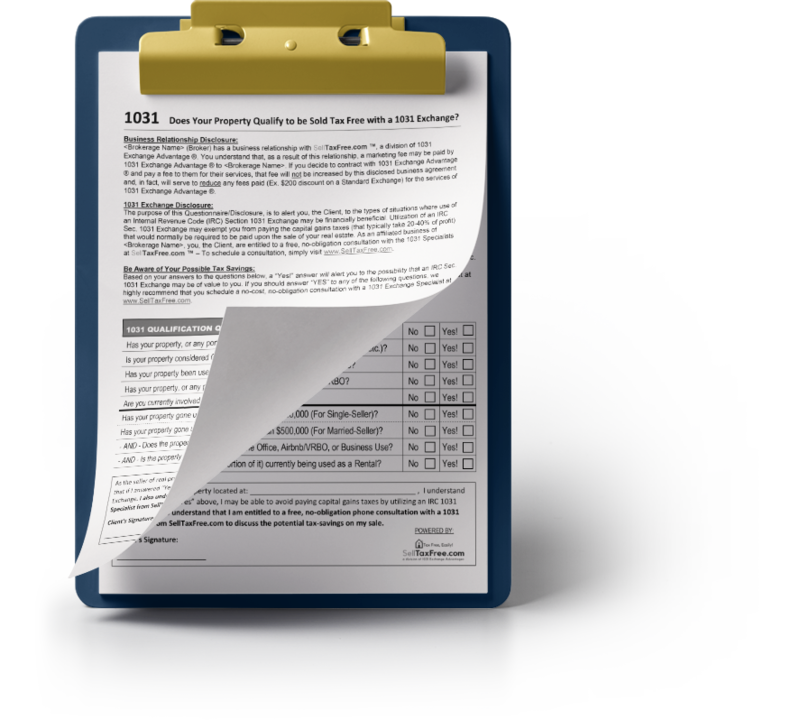 Why should my client use you as their 1031 Accommodator? We offer FREE Consultations with an Attorney or Trained 1031 Specialist on every exchange. In over 35 years of operation we have Never Had a Claim for (a) misappropriation of client funds, or (b) wire fraud due to our Industry-Leading Security Protocols, and Patent Pending Wire-Fraud-Reduction Process. Learn more at www.SellTaxFree.com/Secure-Exchange. We have the Lowest Fees in the Industry for Standard, Reverse, and Improvement Exchanges. * If you find other firms offering a cheaper price, let us know and we'll almost always match it! Why are you partnering with my brokerage and my office? Problem: Great Agents are eager to help their clients, but great Agents are extremely busy. 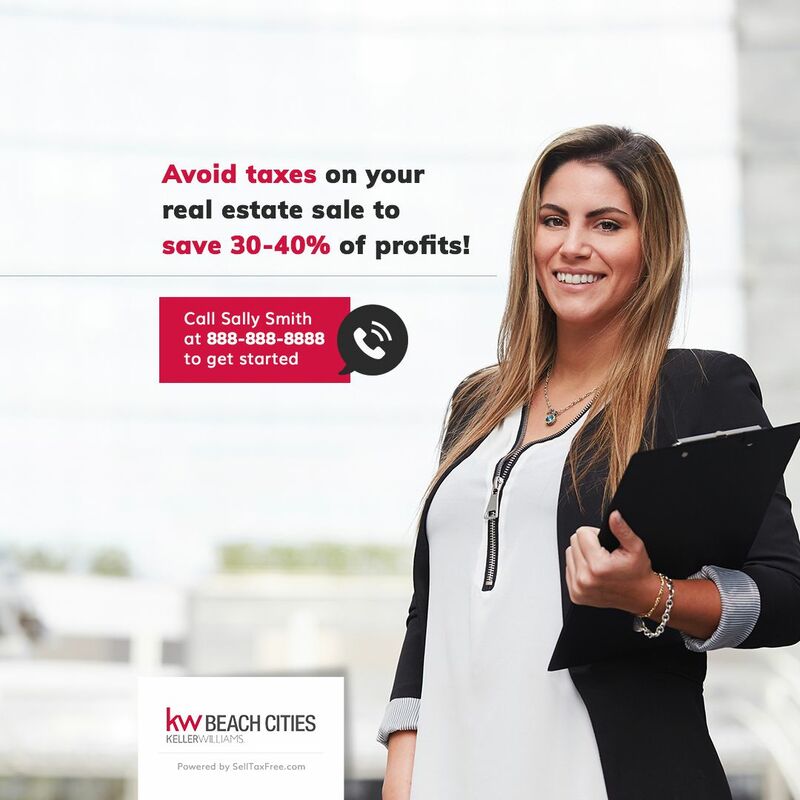 Lots of properties can be sold tax free with 1031, but most Agents and their clients are unaware of which properties qualify, or simply forget to bring up 1031, costing Clients thousands in unnecessary taxes. 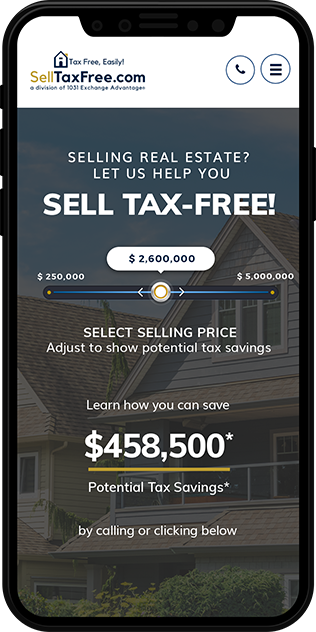 Solution: The SellTaxFree.comTM 'Heads Up' Program gives Agents the ability to spot tax-saving opportunities for their Clients every time they're available. And by bringing up a 1031 exchange, and Agent could save their client hundreds of thousands of dollars.